Fenty's Loss in D.C.: A Blow to Education Reform? When Washington voters declined to give Mayor Adrian Fenty a chance at a second term in Tuesday's Democratic primary, it rattled the education-reform world. Four years ago, Fenty carried every precinct in the city and was talked about alongside rising Democratic stars like Mayor Cory Booker of Newark, N.J., and a little-known Senator from Illinois named Barack Obama. Now Fenty's loss to city council chairman Vincent Gray leaves in doubt not only the status of Washington's revolutionary school chancellor, Michelle Rhee, but also the national momentum for her brand of ambitious  and aggressive  education reform. Like a handful of other big-city mayors, Fenty was given almost exclusive control of Washington's schools in an effort to streamline accountability and minimize politics. His first act was to install Rhee as chancellor in 2007. Prior to her arrival in D.C., she was well known as a fearless reformer. She had launched the influential New Teacher Project in New York City, where she was also instrumental in overhauling the teachers' contract, earning her the enmity of union leaders. When Rhee barreled into Washington, just 12% of the city's eighth-graders were proficient in reading, according to the National Assessment of Educational Progress. If ever there were a school district in need of dramatic change, this was it. Fenty was supportive while Rhee closed schools, reorganized the central office, fired teachers and administrators for poor performance, and let others go for budget reasons or for failing to meet various standards. Even in the midst of the primary campaign this year, Fenty sanctioned the firing of several hundred teachers. That's unheard of in most cities  even with no election on the horizon. 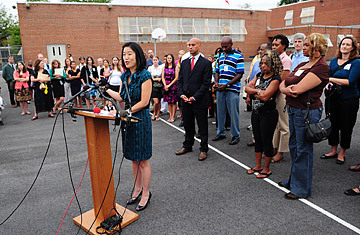 It's worth noting, however, that although pundits frequently described the mayoral primary as a referendum on Rhee  whose high-profile efforts to clean up the school district included her much criticized decision to pose, broom in hand, for a cover of TIME in 2008  she was not the only factor in the Sept. 14 poll results. Fenty's loss turned on a number of issues, including his managerial style; the Washington City Paper had endorsed him, begrudgingly, as "the jerk the city needs." Regardless, the D.C. election will affect education reform. With Fenty soon to be out of a job, it is widely assumed that Rhee will leave her post, voluntarily or involuntarily. She campaigned against Gray, and on style and substance, the two seem far apart. If Gray can persuade her to stay, it would be an impressive act of leadership on both sides, but insiders see little chance. So what would a Rhee exit mean? Most immediately, instability for Washington's students and teachers just as the city was finally experiencing some consistency in its overall strategic direction. Rhee is the seventh superintendent in a decade. She has managed, during her short tenure, to institute a variety of management improvements, new accountability for school leadership, a landmark teacher-evaluation program and one of the most ambitious teacher pay-for-performance plans in the nation. Student outcomes are improving, but the uncertainty caused by the election will slow things down. And although a Gray victory does not mean a wholesale dismantling of Rhee's reforms  as some are suggesting  changes are likely. Her departure could spark a talent drain. Rhee, whom I have known for more than a decade, is a charismatic leader who has attracted people from across the country to work in the city's central office and schools. They may not leave just because of her departure but because they deeply value her style of reform, which is urgent and results-focused. Unless Gray sends early and unequivocal signals about continuing ambitious reform in the city, look for some talent to head elsewhere. Among the employers already eyeing the D.C. talent pool: leading charter-school networks, states that are implementing winning Race to the Top plans and a handful of cities that are pursuing aggressive reform. Outside of Washington, if you listen closely, you'll hear the whispering of teachers' union leaders to Democratic officeholders, warning them that they could share Fenty's fate if they get too far out of line. Or, as New York City schools chancellor Joel Klein put it to me: "The vote on Fenty will be opportunistically misused by the opponents of real school reform." Fenty's loss will reinforce the idea that dramatic change and political survival are mutually exclusive, says Justin Cohen, who leads the school-turnaround work for nonprofit Mass Insight (and previously worked for Rhee in Washington). Rhee's "entire ethos is based upon 'results for children before the interests of adults,' " he says. The irony, Cohen notes, is that "the national conversation about her has been the converse." But perhaps the biggest repercussion of the D.C. election is that it will reinforce the idea that in America's notoriously change-averse schools, you can just hunker down and wait out the reformers. That this, too, will pass. Andrew J. Rotherham, who writes the blog Eduwonk, is a co-founder and partner at Bellwether Education, a nonprofit working to improve educational outcomes for low-income students.